Related FAQ - Following related FAQ will help you find answer quickly. 1) Paypal Express checkout : You are able to pay for the items through Pay pal after registering for Paypal website to have your own ID. 2) Credit Card : It is the fastest and safest way to pay, Master Card and Visa and are now available to use at Qoo10 site. 3) QAccount (Cash Balance): Cash Balance has same ability as cash in Qoo10. It is impossible to change payment method once you complete the order. You need to cancel the order and re-order the items with preferred payment method. For cancellation of order, it has the automatic cancellation system after 5 working days hence you don’t need to cancel it separately. How do I get the receipt for the orders made? Qoo10 provides the receipt to the customer for orders made. If you want to print out the receipt kindly go to My Qoo10 > Recent orders > Click Purchase Description next to the cart no. Then you are able to check or print out the receipt. Please note that printing receipt is only availabe at PC version. How to withdraw the balance in Q-account? 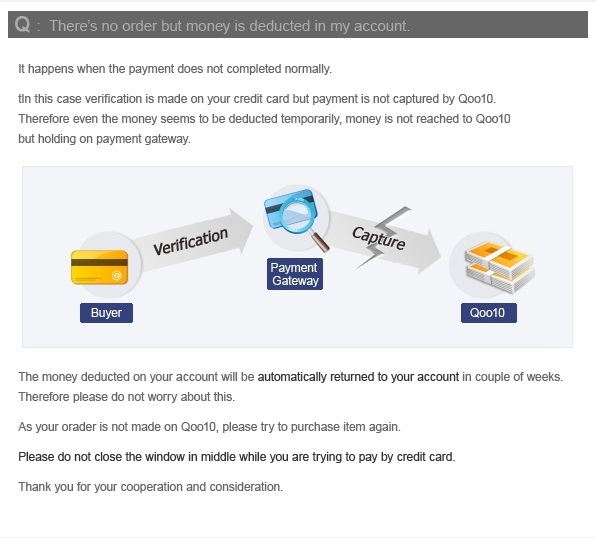 You can ask for the withdrawal from Qaccount to your personal bank account on My Qoo10 - Qaccount - Withdraw. It usually takes 2-3 working days to be reflected in your bank account. First, you need to register the bank info by clikcing my account and then input the amount and click on apply. ※ Withdrawal is only available at PC / desktop version.